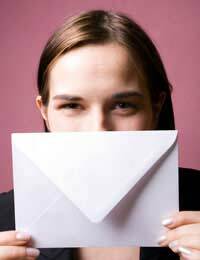 This particular urban legend has caused more than a few people to give up on licking envelopes for life. The story of roach eggs in envelope glue is actually a variation of an older urban legend about spider eggs found in chewing gum but they both are good at one thing; giving the reader the heebie jeebies. The story goes something like this: a woman suffered a paper cut on her tongue while licking an envelope. She thought little of it, suffering through a day or two while her tongue cut healed itself up. In fact, she forgot all about it after a week, even when she started to feel discomfort in her mouth. Her tongue began to swell slightly, and she went to the doctor, worried about infection. The doctor, deciding there was pus under the swelling that needed to be let out, made a small incision…releasing dozens of tiny roaches that had hatched from eggs stuck to the envelope glue. Yes, this story is defiantly one to inspire chills and trigger a horror movie moment; it is also completely untrue. This is an urban legend that is happily passed along with the kind of zeal that tellers of ghost stories experience as they try to creep out their friends. The early days of this legend can be traced back to the Seventies and the urban legend of spider eggs in the bubble gum factories, and more precisely to the roach eggs in taco meat stories of the Eighties. The roach eggs in the envelope glue story has a bit more sophistication, but is no less false, as one can find out with just a tiny bit of research.Roach eggs are carried by the momma roach in a hard, protective capsule known as an ootheca. This is the only place roach eggs can survive, which puts the halt to the story right there. Even if they could survive outside the ootheca, roach eggs are too large to pass unnoticed on an envelope. Should, somehow, the unthinkable happen and some unusually small and hardy roach eggs manage to escape the ootheca of a pregnant roach, wind up in the glue vat before being applied to an envelope, that envelope be sold before the eggs hatch, cause a cut on a victim’s tongue, transfer the eggs, and have the eggs hatch live baby roaches (called nymphs), it would be a one in a million occurrence. The fact that there are many emails circulating about individuals in Florida, California, Texas and many other places that have had this happen to them –exactly the same way—is yet more evidenced that it is just a hoax. This roach eggs in envelope glue urban legend is, like the roaches that are the villain in the story, hard to kill. No matter how many times it is squashed, countless other tellings of the same urban legend spring up to ensure the survival of the species. I worked in envelope companies where roaches had got into the seal glue that is applied to the envelope. Fortunately that company is no longer is business, but it does push this story just a hair closer to being real.